Vertiginous cliffs plunging into wild seas. Birds of prey and rarely spotted oceanic seabirds. The distinct fragrant fynbos of the Cape Floral Kingdom. Audacious baboons. And – just perhaps – a glimpse of a glowing ghost ship in full sail? These are but a few of the many spectacular sights you can expect on a day trip with the Cape Point Explorer, City Sightseeing’s live-guided tour to the 7 750ha Cape Point nature reserve about 60km south-east of Cape Town. As you leave the city behind, you’ll be heading towards the Mother City’s leafy southern suburbs, past the Kirstenbosch National Botanical Garden, towards the charming historic naval settlement of Simon’s Town. En route, you’ll pass through the seaside suburbs of Muizenberg (spot the surfers, year-round) and Fish Hoek (boasting a beautiful, safe beach). First stop is Boulders Beach outside Simon’s Town, home to a famous colony of endangered (and protected) African penguins. These lovable aquatic birds live wild in the area, but their numbers are sadly dwindling. See them up close, and snap their antics, from wooden boardwalks accessed via the Boulders Visitor Centre. 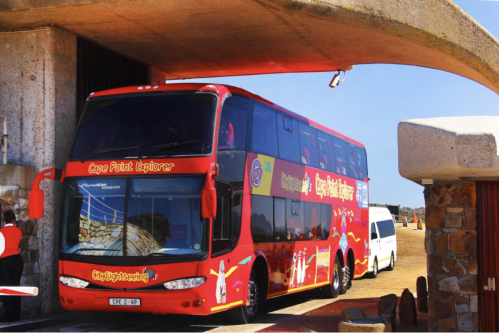 Back on the bus, settle in for some seriously scenic surrounds as you wind your way to the Cape Point reserve entrance. There’s no big game in Cape Point, but look out for antelope such as bontebok and eland, the Cape mountain zebra and creatures like mongooses, tortoises and, of course, those naughty baboons! Birdwatchers can delight in up to 250 species – from raptors and seabirds to Cape sugarbirds and starlings. Cast your eyes out to the ocean: stingrays, dolphins, seals, whales and great white sharks often hang around the treacherous waters. Wander down one of many scenic trails criss-crossing the Cape of Good Hope headland, enjoy a meal with sea views at the stylish Two Oceans Restaurant, or hike up to the historic old lighthouse and its surrounding viewing platform at the top of the peak near the car park. Before departing, pick up a souvenir from one of the shops at the lower and upper funicular stations. Don’t pack your camera or smartphone away just yet. The trip back to Cape Town offers long stretches of vistas out to sea, and you’ll be passing coastal villages such as Scarborough and Kommetjie, offering plenty of scope for pictures and social media status updates! You’ll be back in Cape Town around 5.30pm. Get off either at the V&A Waterfront (stop 1) or Long Street (stop 5). From there, you may hop on any red bus at no extra charge to return to the stop where you left from in the morning. Book your tickets online to get a R20 discount off adult tickets (pay R530, instead of R550). Kids aged two to 11 pay R275. You can also buy your tickets at City Sightseeing’s tour offices at the V&A Waterfront, 81 Long Street in Cape Town, or Camps Bay. When booking, state where you’ll be hopping on – there are departure points in Camps Bay, Sea Point, Green Point and the city, as well as at City Sightseeing’s tour offices at the V&A Waterfront and Long Street. Note that entrance to Cape Point is included in your Cape Point Explorer ticket price, but the conservation entry fee at Boulders, and lunch in Cape Point, are not. See the pickup points and timetable here.